JEE Main 2018 Expected Cut-off for the admission to various Undergraduate Engineering Programmes in NITs, IIITs, other Centrally Funded Technical Institutions (CFTIs), participating State Government Institutions, and several other Institutions is now available on this page. JEE Main Cut off is the minimum qualifying marks which must be secured by the aspirants to qualify the entrance test. The actual cut off of JEE Main 2018 has been released on 30 April by CBSE. General category candidates must have secured 74 marks to pas the test. While, OBC-NCL have to secure at least 45 marks to be eligible to pass JEE Main. Candidates securing equal to or more than JEE Main cut off are eligible to appear for JEE Advanced. JEE Main Exam for the Paper 1 and Paper 2 was held on 8 April 2018 whereas the computer-based exam for the same was conducted on 15 & 16 April 2018. The actual cut-off marks for the JEE Main Exam would be soon released by the CBSE along with the declaration of the result. Sudents can go through JEE Main 2018 Cut Off and get the idea about the would be cut off for qualifying for JEE Advanced. This page also has the number of students who would qualify for JEE Advanced Exam. There was a drastic drop in the JEE Main Cut off for JEE Advanced in 2017 as the cut off for general category dropped to 81. In the same year, topper scored 360/360 marks. The actual JEE Main cut off will be available along with the result on 30 April. JEE Main Cut Off 2018 is the minimum score required by the candidates to get the admission in the top engineering colleges in the country. The JEE Main Cut Offs for JEE Advanced will be decided considering the factors such as the number of students appearing in the exam, difficulty level of the exam etc. The cut-off marks for the current year is decided as per the difficulty level of the questions paper and according to that, the cut-off marks for this year is going to be quite high. The candidates can have the idea of to be announced cut off marks by the reference of the last three year's JEE Main cut-offs (based on Previous years analysis). The expected cut off for the JEE Main is given in the table below. Considering the JEE Main 2018 Exam, the overall difficulty level for the paper was between moderate to difficult. However, this can be seen from the JEE Main cut off 2018. 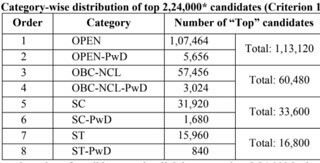 As per the analysis between JEE Main Cut off trends, the cut off to qualify for admission to NITs, IIITs, GFTIs, SFIs and for JEE Advanced is getting dropped. In the previous year, the cut off of JEE Main for General aspirants was 81, which has been dropped to 74 this year. This year, JEE Main Cut off for OBC-NCL is 45, which was previously 49. Accordingly, the JEE Main Cut off for SC and ST in the year 2017 was 32 and 27, respectively. That now in 2018 has been decreased to 29 and 24. What is JEE Main 2018 Cut off? JEE Main Cut Off that is released by CBSE is the minimum qualifying marks to appear in JEE Advanced. Actual Cut off 2018 for JEE Main is now available. JEE Main cut off marks would be available along with the JEE Main Result 2018. Candidates are suggested to go through the JEE Main 2018 Cut off calculated on the basis of the difficulty level of JEE Main Questions. The number of students who can qualify for JEE Advanced is fixed by the JAB. The number as shown in the table can be slightly more than in case of a tie. Only 1,13,120 students will qualify for JEE advanced from the Generala Category. JEE Main Rank will be given in JEE Main Result as it will be calculated on the basis of JEE Main Score Separate Rank lists will be prepared for admission to B.E./B. Tech. and B. Arch/ B. Planning (in institutions other than IITs). The details about the JEE Main 2018 Rank Card indicating All India Rank, State Rank and Category Rank with total marks and marks in each paper can be obtained by following the link below. What after clearing JEE Main Cut off? The candidates who qualify JEE Main 2018 and are declared eligible for JEE Advanced 2018 will have to register again for JEE Advanced 2018 after the declaration of the JEE Main 2018 score. It is compulsory for students to appear in both JEE Main & JEE Advanced 2018 to be eligible for admission to IITs & ISM Dhanbad. The candidates can get the complete information about the JEE Advance by following the link above. To prepare for the JEE Advance 2018, the candidates can check the important tips to be followed to achieve good marks. To get the steps, the candidates have to follow the link given below. For any queries related to JEE Main 2018 Expected Cut-off, you can write to us in the comments section below.